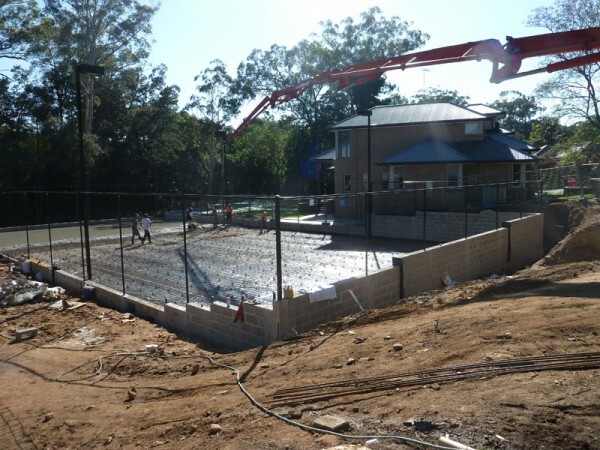 Sportszone Group install tennis courts in private homes and tennis facilities throughout NSW. There’s no question that building a tennis court on your property can be an exceptional investment, not only in terms of property value, but in lifestyle and physical health. How much it will cost you to build your tennis court depends on a number of factors. Here are some things to consider when you are budgeting. Tennis courts are made with a variety of materials. You will most commonly see grass/artificial turf, clay, asphalt, and concrete courts. When deciding on what type you will build, you will be assessing how much you may have to care for your court, climate and humidity, affordability, durability, and your desired speed of game play. “Fast” play surfaces tend to result in “serve and volley” tennis games, whereas “slow” surfaces make for a better game to watch, as balls bounce higher. Wimbledon uses grass courts, and are usually reserved for elite players and events because they can be a challenge for regular homeowners to maintain – reseeding, mowing, watering. The state of the grass will also affect how the balls bounce. In general, grass courts are known as the fastest surface upon which to play tennis. The red-coloured tennis court of the French Open is a clay court. The clay used for clay tennis courts is usually composed of packed and crushed brick, shale, or stone. Clay courts offer slow game play and better shock absorption, but do require upkeep – watering, rolling, brushing. The Australian Open and U.S. Open use hard courts, which tend to be the most common for tennis clubs and sports centres. Made of asphalt or concrete and with a padded layer and paint, these courts have a faster surface minus the upkeep and lower predictability of grass and clay courts. Hard courts support a larger range of player styles, but they can be hard on the body and can reflect a lot of heat. Concrete courts can easily last for decades; asphalt is more affordable but over time may soften and sink in hot climates. Hard courts are the easiest to maintain. These courts offer a medium soft surface for slower game play with a moderate amount of maintenance, thanks to an infill layer atop concrete. Synthetic courts can even be installed over existing hard courts. You can have synthetic courts with artificial turf or a fabric overlay. Before you can build a tennis court, the site must be prepared. You have to clear the land of trees and shrubbery, and undertake grading so that you have a properly flat surface that also allows the court to drain. You may have to bring in crushed stone or gravel to make a sturdy sub-level underneath asphalt or concrete, or use a compactor. The more work that needs to be done to make the area ready for court construction – for example, if the land is rocky, swampy, or with lots to clear – the more expensive the preparation work. For grass courts, sod is installed and borders are drawn. Clay courts need laser-compacting. Asphalt and concrete have to be poured, so a proper frame has to be created for the slab. For concrete, the perimeter cables are also tightened to create tension during the concrete curing process. Asphalt and concrete also need surfacing to keep them in peak condition. Perimeters have to be properly marked and the net installed. Then, there are all the extras to factor in. For example, do you want lights for nighttime play, racket and ball storage, spectator seating, rebound nets for practice, or a fence? These things can seriously drive up your costs, but definitely make for a better looking, more valuable tennis court. The last factor is also crucial: you want a high-quality tennis court. If you skimp on costs and end up with a substandard tennis court, not only could it result in an inferior playing surface, but could actually detract from your property value if lots of work has to be done. The average cost of a hard court is around $90,000, while a synthetic grass court averages at $100,000. You’re also looking at about $13,000 for court lighting. In terms of providing you and your family an excellent means to get or stay fit, a great way to enjoy your property and make memories, it’s priceless.